Christa once said, and I can never find the original post, that she was incapable of talking about Haruki Murakami’s writing without breaking into an interpretive dance. That’s kind of how I feel about Kristin Hersh’s memoir Rat Girl. It’s kind of fitting that I need to quote Christa, since she’s the entire reason I read this book. I was feeling a little guilty for abandoning Anthropology of an American Girl, which Christa loved and recommended to me. I did not love it. Not at all. So when she started raving about Rat Girl, I saw my chance at redemption. Rat Girl is the kind of good that gives you nextbookaphobia, where you don’t want to start another book because you know it will not be as good as the one you just finished (you’ve been put on notice Mr. Franzen and Freedom). In her memoir Hersh chronicles 1985-1986 the year she was diagnosed with bipolar disorder, her band Throwing Muses landed a record deal, and she became a single mother at the age of nineteen. It’s a lot, and the way Hersh tells her story is beautiful. 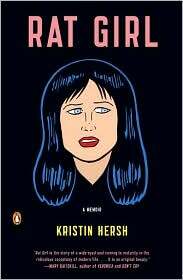 She’s written the memoir based on the diary she kept that tumultuous year and she keeps the story in eighteen-year-old Kristin’s point of view the entire time. A lot of memoir is rife with the “me of today” reflecting on the “me of yesteryear,” making excuses, justifying behavior, and reflecting on the significance of bygone events. It’s this kind of wankery that makes a lot of memoir insufferable. It’s as though the memoirist doesn’t trust the reader enough to figure out the importance of the moments he/she chose to share. What a story it is. From squatting in a dead guy’s abandoned apartment to suffering a concussion after being hit by a car (Hersh thinks she’s been hit by a wicked witch) to the slow spiral into mania, the story is engrossing and engaging. Then there’s the music, the music that Hersh sees as colors. Music that plagues her and makes her feel tattooed by the songs. I’ve read a lot of books about Rock & Roll and nobody has been able to put it into words quite the way Kristin Hersh has. It makes me wish I had been a Throwing Muses fan back in the day (talk about missing the boat). If you’ve ever felt music was your religion or your life or had a deep, confusing, inexplicable relationship with Rock & Roll you should read this book (you can get a teeny, tiny taste by reading Hersh’s Largeheartedboy Book Notes essay). While I believe Hersh’s relationship with music is wholly unique to her, she writes about it in such a way that it gives those of us who have yet to find the words hope that those words are still out there. I think redemption is *mine*. Finally I win in the giant battle of book recs. I’m like 1-20.